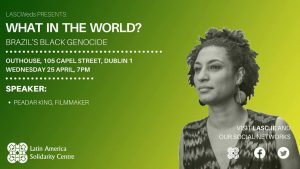 This special screening of the hard-hitting episode focusing on the black genocide in Brazil from the “What in the World?” documentary series will feature a discussion with director Peadar King. The event will also include a discussion of th e recent assassination of the prominent black community leader, Marielle Franco, in Rio de Janeiro, and the increasing militarization of Brazil’s major cities. Brazil is steeped in violence. According a report by the Brazilian Forum for Public Security there were 58,383 violent deaths in 2015. And young black people aged between 14 and 29 are the most likely the victims of that violence. A 2017 United Nations report concluded from its analysis of Brazil’s death toll that a young black man dies every 23 minutes in Brazil, a black youth is twelve times more likely to be murdered that a white youth. As a result, many are now referring to this situation as a genocide.